Ships Saturday, April 27 if ordered in the next 15 hours and 33 minutes! The Sonicare FlexCare R910 toothbrush features the latest innovations in oral hygiene from Philips to deliver the cleanest, most refreshing teeth you can get between dentist visits. It features new ProResults brush heads, multiple cleaning modes, and built-in timers. Feel like you just went to the dentist, every day. With a lithium ion battery, you don't have to worry about running out of power when you're traveling; with regular brushing, the FlexCare lasts up to two weeks between charges. A deluxe recharge gauge on the handle keeps you notified of the amount of charge left. ● Lithium ion battery that lasts up to 2 weeks between charges. 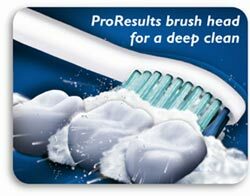 ● ProResults brush head for more effective clean teeth. ● Smartimer that automatically shuts off the toothbrush after the recommended 2 minutes. Warranty Service Sonicare will replace your handle or charger, within 2 years of the original retail purchase, if either is found to be defective in materials or workmanship. * This warranty is valid for the original retail purchaser from the date of initial retail purchase. Save your receipt as proof of date of purchase. This warranty gives you specific legal rights, and you may also have other rights, which vary, from state to state. If you would like to obtain warranty service, please call our Customer Care Center at 1-800-682-7664. Service representatives are available Mon-Fri from 8:00am to 8:00pm ET. Saturday and Sunday 9:00am to 5:00pm ET. Please have your Sonicare with you when you call. Not covered under warranty (all Sonicare models) Brush heads. Damage caused by misuse, abuse, neglect or alterations. Normal wear and tear, including chips, scratches, abrasions, discoloration or fading. All returns must have prior authorization (RA#) from us to ensure proper tracking and crediting of the return. All returns must be shipped, with freight prepaid, to our designated returns center. Shipping costs (outgoing/return/re-shipping) and related return fees for any item/any return reason will not be credited or paid for by us, unless directly incurred as a result of our shipping error or as otherwise agreed to by us. No returns will be credited prior to receipt and processing of the authorized return at the designated return center. Upon receipt and processing of the authorized return, we will issue credit for the originally invoiced product cost of the returned item(s), not including any shipping or returns costs (unless due to our shipping error). All returns are for refund only. Replacement product must be ordered again as a new order with a new order number and will include freight and handling charges. Whether due to buyers remorse, dissatisfaction or any other reason, we will accept returns for good stock items (unused, re-saleable items in original packaging), via the terms of our return policy. In instances where a consumer receives a non-working, incomplete or otherwise defective product, we first encourage the consumer or retailer to seek remedy of the situation, as manufacturers recommend, via the valid manufacturers warranty, included with the product. Should the consumer wish to return the product to us for credit, then the product may be returned via the terms of our return policy. If the manufacturer recalls a product sold to the consumer through us, we will assist in the implementation of the recall according to the terms as stipulated by the recalling manufacturer. If the product delivered to the consumer is not the product specifically ordered by the retailer, the unused and re-saleable product may be returned for a full credit if product is returned to us within 30 days following the receipt of such product by the consumer. The cost of original outbound freight, return and related freight will be borne by us. 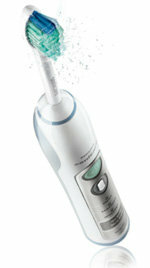 Review "Philips Sonicare® HX6911/02 FlexCare Rechargeable Toothbrush"